The letter of thanks from then Datuk Najib to the students. One afternoon, 40 years ago, a group of Form Two students sat huddled in a corner of their school hall to discuss the shattering news — the death of then prime minister Tun Abdul Razak Hussein of leukaemia in London. It was reported in all the major newspapers, and, the night before on television, it was sombrely announced that he had passed on. The grief was palpable. There were dozens of pictures of Tun Razak and his family, in tabloids and magazines at the local mamak and sundry shops. It was THE news, and a talking point even after a year into former Tun Hussein Onn’s tenure as the country’s third prime minister. Tun Razak was a much-loved statesman, and to the students, he was their eminent leader. They were too young to remember Tunku Abdul Rahman. To them, he was just Bapa Kemerdekaan. That Tun Razak was instrumental in restoring peace following the May 13, 1969 riots, put him on a pedestal. When Tun Razak became the premier in 1970, the students were just 8. But, that did not stop them from learning about him and absorbing whatever information they discovered about the “first” family, from teachers, parents and through the grapevine. Every morsel of information was shared among them each time they met during school recess. Two days after Tun Razak had left for London, ostensibly on a holiday with his family, one of the students found out the contrary — he was actually being treated for “a blood disease”. When she shared this information with the group, they were upset, but optimistic that he would get well and return soon. It was no surprise then, that when the news of his death spread on that fateful afternoon, they were shocked beyond words. In the last year of Tun Razak’s life, they had read up on him, his work and his policies. Although they did not fully understand some of them, it was a learning experience for them. About a week after his death, this group penned a letter to Tun Razak’s family, conveying their condolences, saying how sorry they were that he had died too soon. A month later, at a morning assembly, the headmistress called on the group and praised them for the letter. 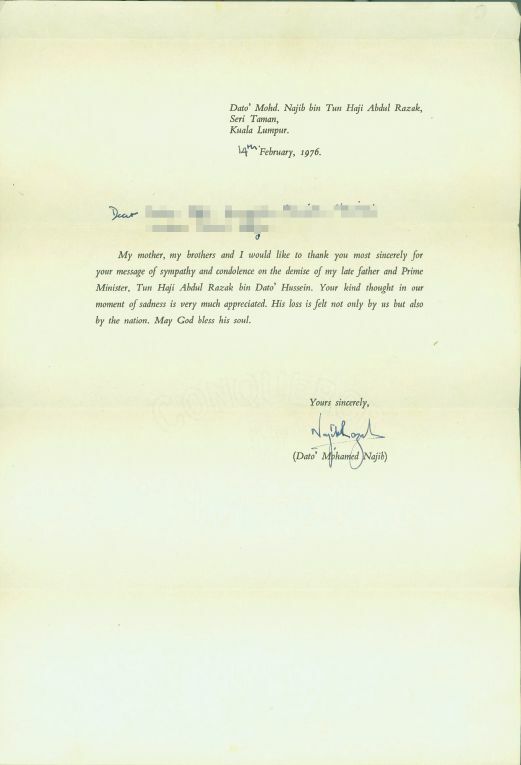 She also handed a letter from then Datuk Najib thanking them. The students were astounded. They never expected to be reciprocated. To them, the condolence note was a simple gesture, guided by a feeling of respect for their prime minister. They just wanted to show that they were responsible citizens. Respect and honour for leaders, statesmen, those in authority and the elderly were the cornerstone of our culture and tradition in the 1970s and 1980s. In school, we were taught, and at home reminded constantly, to hold them in high regard. All our values appear to have vanished in this new millennium. At younger and younger ages, we are witnessing a rude attitude and foul language. From the 5-year-old, who defiantly puts her hands on her hips and declares to her mother that she cannot be bossed around, to the four-letter words that spew forth from an adolescent’s mouth, lack of respect is increasingly prevalent. There was a posting on Facebook some time back about a Standard 5 pupil who told a teacher to “get a life” because he had been reprimanded for not doing his homework. In the past, a student would have grudgingly accepted the admonition, and then vowed to do better. And, there are scores of jokes, innuendos and caricatures that poke fun at our leaders and others on social media, in short, being rude and disrespectful. Malaysians are known the world over for their warmth, hospitality, respect and love for each other, but a substantial majority of the new generation seem to have broken with tradition. We have to bring back those days. Yes, respect has to be earned, but there is no excuse for rudeness or ill-mannered behaviour. Somehow, at some point, the Pandora box opened and the evil spilled out. No one knows why, or who’s to blame for today’s transgressions. Is it the borderless era, the Internet, or parents, who feel that they should give “space” and “freedom” to their children so that they are able to express themselves with abandon? With freedom comes responsibility. There are limits, boundaries, laws and rules of conduct and behaviour, and ethics that are obligatory on us as responsible citizens. There are also unwritten norms and conventions, and religious and cultural traditions that guide us. Malay cultural values such as adab (manners/protocol), and religious principles such as amanah (integrity) should steer our daily lives and be the guiding principles in everything that we do. I am reminded of our Rukun Negara, the five principles: belief in God; loyalty to king and country; upholding the constitution; rule of law; and good behaviour and morality. These should not merely be lip service, they must live within us so that we are reminded that each time we are faced with a difficulty, we fall back on these principles to guide us through the maze. “Be peaceful, be courteous, obey the law, respect everyone.”— Malcolm X.